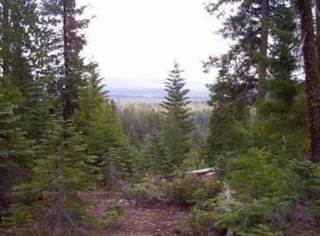 Sierra Pacific Industries to clearcut log SW of Lassen Volcanic National Park. This THP is about 9 miles SW of Lassen Volcanic National Park, and about 4 miles SW of Mineral, CA and Highway 36 at an elevation of 3,200 to 5,400 feet. Sierra Pacific Industries is planning a mostly clearcut tractor and cable logging operation in white fir, sugar pine, incense cedar and ponderosa pine forests. There is an existing landslide scarp 250 feet east of unit 144 outside of the THP area, and section 18 is adjacent to the Ishi Roadless Area. SPI is planning to construct and use roads, landings and crossings during the winter period, and use ground based equipment within areas designated for cable logging to construct seasonal roads at the top of several cable units. 74 road drainage sites are planned for work including rocking, dip construction, ditch cleaning, and culvert repair/replacement. There is a northern goshawk territory (sections 14 and 15) within the THP area in the vicinity of Shelton Ridge. Western campion was found in section 6, Sanborn’s onion was found outside of unit 1016 in section 10, Callahan’s mariposa lily was found outside of unit 91 in section 9, and blushing wild buckwheat was found in unit 123, and in sections 06, 08, 17 and 33. There is a CA spotted owl territory (section 13) within the THP area in the vicinity of the N Line Crossing at Jackass Gulch. 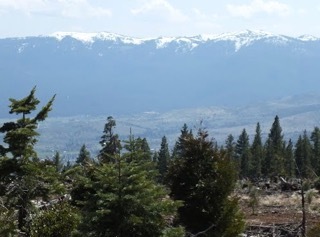 Sierra Pacific Industries to clearcut log SW of Alturas, CA. This THP is about 30 miles SW of Alturas, CA, 8 miles south of Adin, CA and just east of Highway 139 at an elevation of 5,200 to 6,300 feet. Sierra Pacific Industries is planning a mostly clearcut tractor based logging operation in ponderosa pine, Jeffrey pine and white fir forests. Five road drainage sites are planned for work including rocking, dip construction, ditch cleaning, and culvert repair/replacement. A greater sandhill crane was reported 1.1 miles from the THP area in section 31, and there are 2 historic (2002) northern goshawk nest sites in the THP area including a goshawk nest site in section 3 within .25 miles of unit 3B, and a goshawk nest site in section 13 within .75 miles of unit 12B. Susanville milk vetch was found in units 11B, 16B and 16C; Ash Creek mouse tail was found within unit 12A, adjacent to unit 11A, and along numerous haul roads and in section 12; and Ash Valley milk vetch was found within unit 12A, adjacent to Hunsinger Flat Road in section 1, and adjacent to an existing seasonal haul road in section 12. Sierra Pacific Industries to clearcut log NW of Pollock Pines, CA. This THP is about 6 miles NW of Pollock Pines, CA and Highway 50 at an elevation of 3,000 to 4,200 feet. Sierra Pacific Industries is planning a tractor and cable logging operation on steep and unstable slopes in white fir, ponderosa pine, sugar pine, incense cedar and Douglas fir forests. There are 4 erosional gorges in section 32 downslope of a breached ditch, multiple shallow and deep seated landslide terrain sites in section 33, and 2 adjacent landslides in section 34. SPI is planning to use and construct roads, landings and crossings during the winter period, and use ground based equipment on steep slopes designated for cable logging in units 4301H and 404M. They also are planning to use tractors to pile slash on slopes between 40% and 50% grade, and use tractors on slopes over 30% grade that do not flatten before reaching a watercourse. 14 road drainage sites are planned for work including rocking, dip construction, ditch cleaning, and culvert repair/replacement. There are northern goshawk nests within 900 feet and 1.6 miles of the THP area, a bald eagle nest within 2.1 miles of the THP area, and an osprey nest within 1.35 miles of the THP area. Sierra Clarkia was reported in units 481, 550, 553 and near units 462, 481 and unit 544. Three CA spotted owl nesting territories are located in the THP area ranging from within the THP area (section 16), 2000 feet from the THP area (section 33), and 2300 feet from the THP area (section 30). 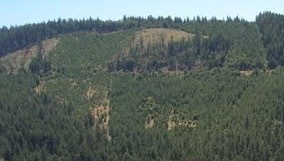 Sierra Pacific Industries to clearcut log near Ice House and Union Valley Reservoirs NE of Pollock Pines, CA. 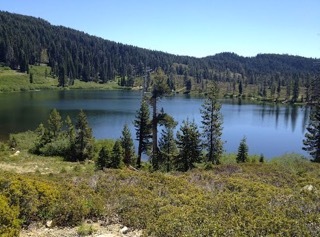 This THP is about 11 miles NE of Pollock Pines, CA and about 6 miles north of Highway 50 near Ice House Reservoir and Union Valley Reservoir (which are popular picnicking, swimming, fishing, hunting, hiking, boating and OHV use areas) at an elevation of 4,920 to 6,360 feet. Sierra Pacific Industries is planning a tractor based logging operation in white fir, ponderosa pine, sugar pine, incense cedar and Jeffrey pine forests. The THP area is close to 3 campgrounds including the Northwind and Strawberry Point Campgrounds near Ice House Reservoir (.45 and .17 miles), and the Jones Fork Campground near Union Valley Reservoir (1,000 feet). SPI wants to use and construct roads, landings and crossings during the winter period, and construct 5 segments of short roads into watercourse areas for water drafting purposes. 23 road drainage sites are planned for work including rocking, dip construction, ditch cleaning, and culvert repair/replacement. There are osprey nests within 435 feet, 860 feet, and .41 miles of the THP area, and bald eagle nests are located within .9 miles, .65 miles and .89 miles from the THP area. A sharp shinned hawk was reported within .02 miles of the THP area in section 35, and northern goshawk nests were reported within .23 miles, .38 miles, .40 miles, and 1.8 miles of the THP area. Wooly violet was found in units 190, 290, 302, 311, FB1, FB2, FB3, FB4 and FB5, Coleman’s piperia was found in units 190, 290, 291, 293, 302, 303 and 500, Upswept moonwort was found in unit 310, Scalloped moonwort was found in unit 311, Mingan’s moonwort was found in units 310 and FB6, Mountain moonwort was found outside of harvest units, and Jonesville Springbeauty was found in unit FB7. There are 7 CA spotted owl nesting territories ranging from .17 miles to 2.3 miles from the THP area in sections 1, 13, 21, 24, 28, 32, 34, 35 and 36. Sierra Pacific Industries to log SE of Quincy, CA near Graeagle. This THP is a couple of miles SE of Graeagle, CA and Highway 89 and about 16 miles SE of Quincy, CA at an elevation of 4,460 to 5,240 feet. 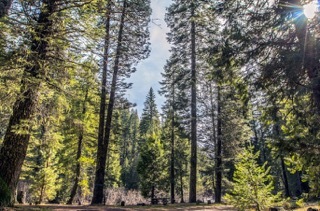 Sierra Pacific Industries is planning a tractor based logging operation in ponderosa pine, Jeffrey pine, Douglas fir, white fir, incense cedar and sugar pine forests. 27 road drainage sites are planned for work including rocking, dip construction, ditch cleaning, and culvert repair/replacement. Willow flycatcher habitat was reported in section 25, and there are 3 CA spotted owl territories within 1.3 miles of the THP area. 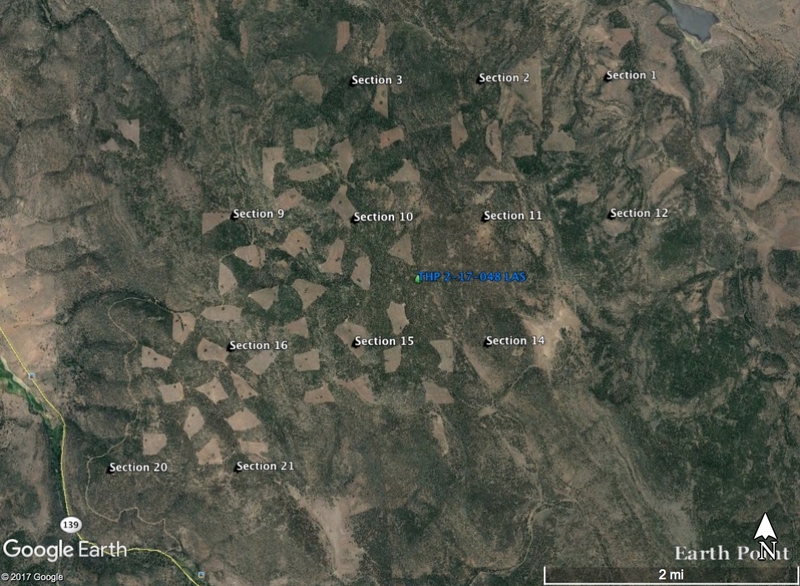 This THP is about 5 miles NW of Susanville, CA and Highway 36 at an elevation of 5,600 to 7,000 feet. Sierra Pacific Industries is planning a clearcut tractor based logging operation in ponderosa pine, Jeffrey pine, white fir, incense cedar and sugar pine forests. Temporary spur roads under 500 feet are proposed for construction without pre designation to accommodate log loading operations. 46 road drainage sites are planned for work including rocking, dip construction, ditch cleaning, and culvert repair/replacement. There is greater sandhill crane habitat at Paiute meadows adjacent to unit 23 and at Coleman lake, and an historic (1991) sighting was reported of a CA red fox .75 miles north of the THP area in section 26. Scalloped moonwort was found in section 2, and Susanville beardtongue was found in sections 01, 03, 34 and 35. 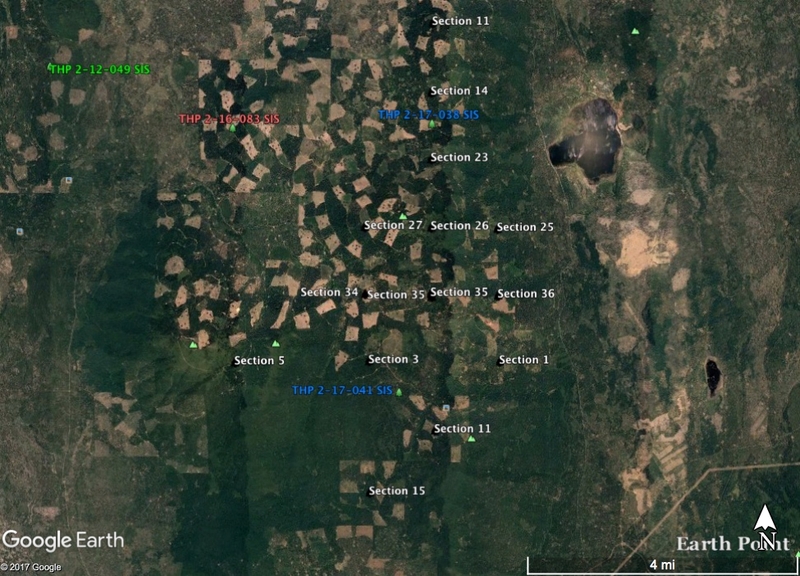 Sierra Pacific Industries planning a pair of clearcut THPs NE of McCloud, CA. This THP is about 18 miles NE of McCloud, CA and about 7 miles north of Bartle, CA and Highway 89. Sierra Pacific Industries is planning a clearcut tractor based logging operation in white fir, sugar pine, ponderosa pine, Douglas fir, lodge pole pine and incense cedar forests at an elevation of 5,000 to 6,480 feet. There are 4 goshawk nest sites including; a nest 600 feet NE of unit 25A in section 25, a nest site in section 21, a nest site in section 11, and a nest site in section 9. Four spotted owl nesting territories are located within 1.3 miles of the THP area in sections 12 and 23. This THP is just north of SPI’s South Buck THP 2-17-041 SIS. 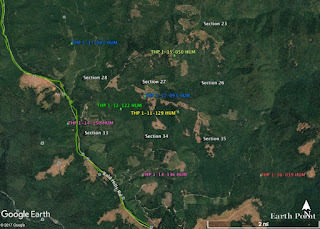 This THP is about 15 miles NE of McCloud, CA and about 4 miles north of Bartle, CA and Highway 89 at an elevation of 4,200 to 5,800 feet.. Sierra Pacific Industries is planning a clearcut tractor based logging operation in white fir, ponderosa pine, sugar pine, incense cedar, and knob cone pine forests. Construction and the use of roads, landings and crossings are planned during the winter period, and the construction of temporary spur roads under 500 feet without pre designation is planned to accommodate log loading operations. An existing road within a class I watercourse (McKay Creek) is planned for use in sections 11 and 15. Four road drainage sites are planned for work including rocking, dip construction, ditch cleaning, and culvert repair/replacement. There are 2 northern goshawk territories in the THP area including a goshawk nest site .25 miles from THP units in section 16 on Forest Service lands (2 alternative nest sites exist within 300 feet and 400 feet of an haul road), and a goshawk nest site .8 miles from harvest units in section 12. Hot rock daisy was found on the edge of the SE boundary of unit 11D and along an existing seasonal road 200 feet east of unit 11D. There are 4 spotted owl nesting territories within 1.3 miles of the THP area, in sections 4, 8, 12, 16 and 32. This THP is just south of SPI’s Big Horse THP 2-17-038 SIS. Green Diamond Resource Company to log near Patrick’s Point State Park and Highway 101. This THP is about 6 miles north of Trinidad, CA, and just east of Highway 101 and Patrick’s Point State Park. 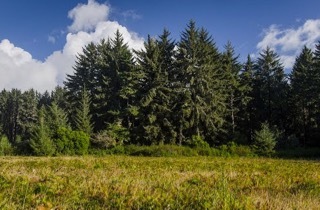 Green Diamond Resource Company is planning a commercial thinning tractor and cable logging operation on steep and unstable slopes in Douglas fir, redwood and Sitka spruce forests. There are 5 landslide terrain sites (1 fill slope failure and 4 rapid shallow landslides) in units A and B, and 4 steep head wall swales (debris slides/debris slopes) in unit B. Six road drainage sites are planned for work including rocking, dip construction, ditch cleaning and culvert repair/replacement. Five osprey nest sites are located within the THP area including; an osprey nest within .25 miles of the LP Mill Road, 2 osprey nests within .25 miles of the BL2000 Road, an osprey nest 400 feet NW of unit B, and an osprey nest 100 feet west of unit B. A bald eagle nest is located 1.5 miles north of the THP area, and marbled murrelet habitat exists on Humboldt Redwoods State Park lands within .25 miles of the LP Mill Road. In 2007, a sharp shinned hawk was reported to be located 1.1 miles east of the THP area, marten have been detected 1.1 miles east of the THP area, and a newly colonized great blue heron rockery is located .22 miles east of the BL2000 Road. 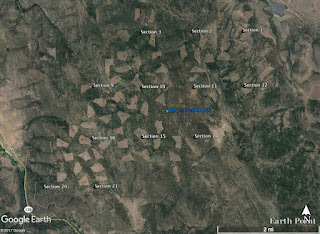 There are 5 spotted owl nesting territories within 1.3 miles of the THP area, including spotted owl nesting territories within .5 miles of units A and B.
Sierra Pacific Industries to log in nice high elevation stands west of Quincy, CA. This THP is about 20 miles NE of Chico, CA, 22 miles west of Quincy, CA, and about 18 miles SW of Chester, CA and Lake Almanor at an elevation of 6,000 to 7,000 feet. Sierra Pacific Industries is planning a selection and seed tree removal tractor based logging operation in nice high elevation stands of red fir, lodge pole pine and western white pine. 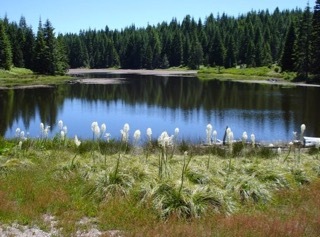 There are numerous seasonal wet areas and wet meadows throughout the THP area, a collapsed mine shaft, and sections 21 and 28 are adjacent to the Chips Creek Roadless Area. SPI is planning to re-construct a steep portion of the T Line Road exceeding 15% for 400 feet, and utilize 2 existing segments of seasonal roads within watercourse areas including the T Line Road which runs parallel to a seasonal pond/wet meadow, and the 200T Road which runs adjacent to a wet meadow. 67 road drainage sites are planned for work including rocking, dip construction, ditch cleaning and culvert repair/replacement. 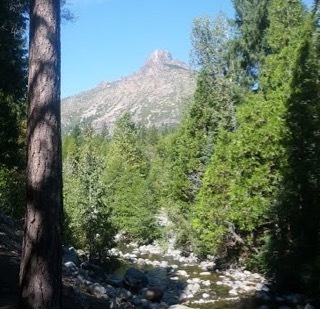 Sierra Pacific Industries to clearcut log trees up to 48” dbh south of Lassen National Park. This THP is about a dozen miles south of Lassen Volcanic National Park and about 14 miles SW of Chester, CA and Lake Almanor. Sierra Pacific Industries is planning a mostly clearcut tractor based logging operation in white fir, sugar pine, incense cedar and ponderosa pine forests at an elevation of 4,600 to 5,200 feet. SPI is planning to use tractor crossings during the winter period, and construct roads and landings during the winter period. 85 road drainage sites are planned for work including rocking, dip construction, ditch cleaning and culvert repair/replacement. An osprey nest is located within .25 miles of the 10L Road in section 32, and dwarf resin birch was found in section 29. There are 3 CA spotted owl nesting territories within 1.3 miles of the THP area in sections 01, 32 and 36. This THP is about 20 miles SE of Eureka, CA and Highway 101 near Snowcamp Lake at an elevation of 3,720 to 4,680 feet. Sierra Pacific Industries is planning a clearcut tractor and cable logging operation in Douglas fir, white fir, ponderosa pine, sugar pine and incense cedar forests. 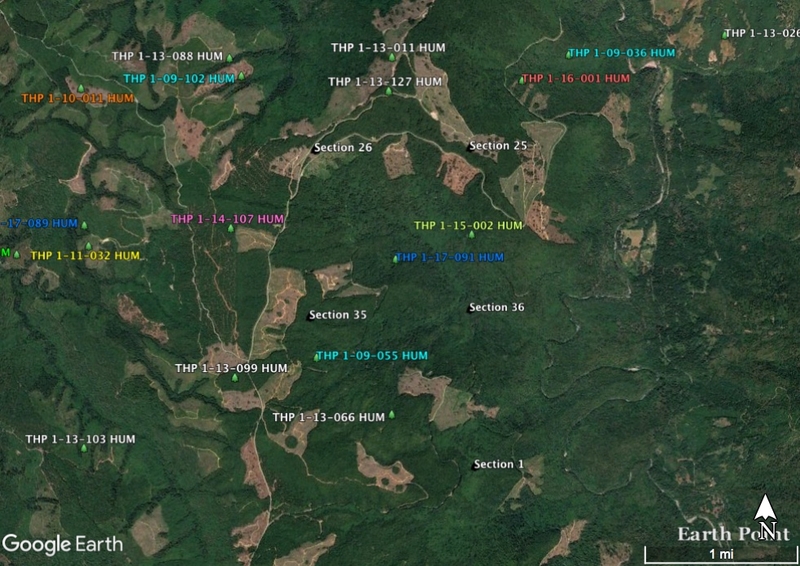 The THP area flows into Redwood Creek which is listed as an impaired watershed for sediment/siltation/temperature and into the Mad River which is listed as an impaired watershed for sediment/siltation/temperature/turbidity. Sierra Pacific Industries is planning to construct roads and landings during the winter period. Four road drainage sites are planned for work including rocking, dip construction, ditch cleaning and culvert repair/replacement. In 2007, coast fawn lily was reported to be within a watercourse area in the southern portion of unit 6A. There are 7 spotted owl nesting territories within 1.3 miles of the THP area. 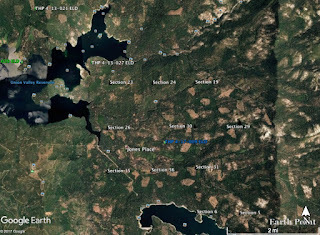 Sierra Pacific Industries to clearcut log near Chester, CA and Lake Almanor. This THP is a mile NW of Chester, CA and a few miles NW of Highway 36 and Lake Almanor at an elevation of 4,600 to 5,200 feet. Sierra Pacific Industries is planning a mostly clearcut tractor based logging operation in Jeffrey pine, ponderosa pine, sugar pine, white fir, incense cedar and Douglas fir forests. A 1.25 mile long shaded fuel break is proposed along Warner Valley Road. 15 road drainage sites are planned for work including rocking, dip construction, ditch cleaning and culvert repair/replacement. There is a bald eagle nest .16 miles south of the THP area on Collins Pine lands in section 2, and an active (2017) bald eagle nest was reported across from the Church of Christ along the Warner Valley Road 1.3 miles east of the THP area. From 2002 to 2003 a rarely seen Sierra Nevada red fox was reported to be within 1 mile of the THP area in section 27, and in 2000, a goshawk nest was reported .36 miles west of the THP area in section 34. There are some older (historic) wildlife sightings including: an osprey (1971) nest site .43 miles south of the THP area in section 11, a Sierra Nevada red fox (1996) sighting .13 miles east of the THP area in section 6, and a Cascade Frog (1924) sighting .76 miles west of the THP area in section 27. Rocky Mountain chickweed was reported to be growing in section 23 within unit 203, and in sections 14 and 24. This THP is about a dozen miles NE of Trinidad, CA, 7 miles SE of Orick, CA and a few miles east of Redwood National Park at an elevation of 1,200 to 2,600 feet. Green Diamond Resource Company is planning a mostly clearcut tractor and cable logging operation on steep and unstable slopes in redwood and Douglas fir forests. The THP area flows into the Klamath River which is listed as an impaired watershed for sediment, temperature, dissolved oxygen and nutrients. There are shallow rapid landslides along the SW corner of unit D, in the SE corner of unit E, and a deep seated landslide in unit E. 10 road drainage sites are planned for work including rocking, dip construction, ditch cleaning, and culvert repair/replacement. A fisher was spotted in unit A in 1994, and a golden eagle was reported over 1.5 miles from the THP area. There are 4 spotted owl nesting territories within 1.3 miles of the THP area including spotted owl nesting territories within .5 miles of unit G.
Sierra Pacific Industries to log in nice high elevation stands used by California’s only wolverine. This THP is about 2 miles NE of Sierra City, CA and Highway 49 at an elevation of 4,700 to 7,800 feet. Sierra Pacific Industries is planning a tractor and cable logging operation on steep and unstable slopes in ponderosa pine, Jeffrey pine, Douglas fir, incense cedar, sugar pine, red fir, white fir and western white pine forests. 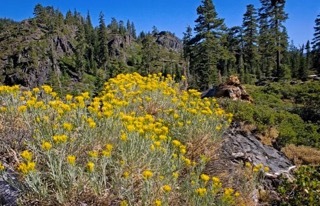 The THP area is in a high elevation forest near the Pacific Crest Trail (sections 23, 25 and 35) where a wolverine was spotted during the winter of 2008/2009. There are unstable areas in sections 19, 23 and 25. Sierra Pacific Industries is planning to use class III (intermittent) crossings during the winter period, and re-construct 400 feet of steep road across 70% slopes. They also are planning to construct a landing and a road within an unstable area in section 23, and use ground based equipment on existing benches within unstable areas in section 23. 21 road drainage sites are planned for work including rocking, dip construction, ditch cleaning, culvert repair/replacement and restoration of washed out crossings. Rocky mountain chickweed was reported in sections 19 and 25, and there are 5 CA spotted owl nesting territories in the THP area (adjacent to 1.4 miles from the THP area). Green Diamond Resource Company to clearcut log trees up to 60” dbh SE of Trinidad, CA. This THP is about 12 miles SE of Trinidad, CA and Highway 101 at an elevation of 1,120 to 2,120 feet. 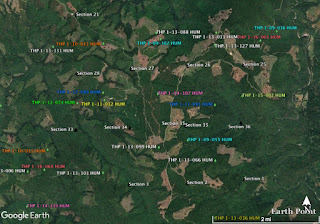 Green Diamond Resource Company is planning a mostly clearcut tractor and cable logging operation on steep and unstable slopes in redwood and Douglas fir forests (trees over 40” dbh in units A and B, and trees over 60” dbh in unit D). The THP area flows into Redwood Creek which is listed as an impaired watershed for sediment and temperature. There is a small shallow rapid landslide terrain site, and associated debris slide in unit E. Green Diamond Resource Company is planning to construct a temporary road inside unit E through the outer edge of a class II (mid sized) watercourse, and construct a temporary road onto a bench between 2 class II (mid sized) watercourse areas in unit E. 16 road drainage sites are planned for work including rocking, dip construction, ditch cleaning, culvert repair/replacement and restoration of washed out crossings. In 1992, a fisher was reported inside unit B and southern torrent salamanders are known to occur immediately adjacent to unit B. 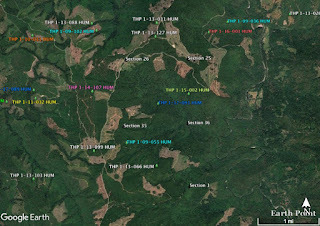 There are 9 spotted owl nesting territories within 1.3 miles of the THP area, including spotted owl nesting territories within .25 miles of unit A, and within .5 miles of units B, C, D and E.
Green Diamond Resource Company planning a pair of clearcut THPs SE of Trinidad, CA. This THP is about 10 miles SE of Trinidad, CA and Highway 101 at an elevation of 1,040 to 2,200 feet. 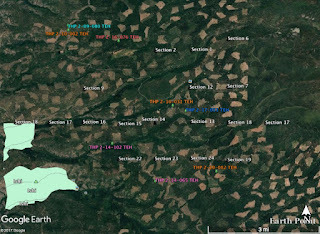 Green Diamond Resource Company is planning a mostly clearcut tractor and cable logging operation on steep and unstable slopes in Douglas fir, redwood and western hemlock forests. There are 6 shallow rapid landslide terrain sites along the lower portion of unit B, and a wet area in unit B. Green Diamond Resource Company is planning to use an existing skid trail within a class II (mid sized) watercourse area inside unit F. A Pacific fisher was reported inside unit C in 2007, and inside unit D in 2013, and a sharp shinned hawk was reported 2.1 miles NW of unit A. 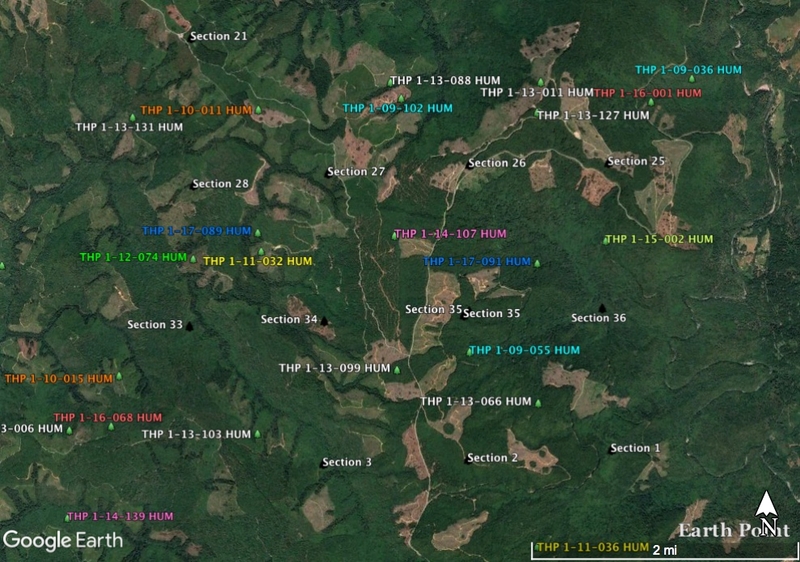 There are 6 spotted owl nesting territories within 1.3 miles of the THP area, including a spotted owl nesting territory within .5 miles of unit C. This THP is just west of Green Diamond Resource Company’s recently proposed THP 1-17-091 HUM (KK 800 THP).